The Junior League of Detroit is focused on improving the lives of children and families in the City of Detroit. A major area of need in our community is the basic need of food. The goal of the Junior League of Detroit’s Project EAT initiative – food, Education, Access and Tools – is to empower families in the kitchen and at the table. One major part of the project is the Junior League of Detroit’s “Kitchen Kits” which together with our partner Humble Design provides families with the tools to cook a healthy home cooked meal every day. The Junior League of Detroit is not only known for our good work in the community – we are also known for our outstanding fundraising efforts! Our signature fundraiser – the biennial Designers’ Show House – takes advantage of the area’s fabulous architecture and top-notch design community to transform a local home into a “show house” for the public to enjoy for several weeks. Since our first Designers’ Show House in 1976 close to $4 million has been raised through the event to help fund the JLD’s many community based projects and programs. 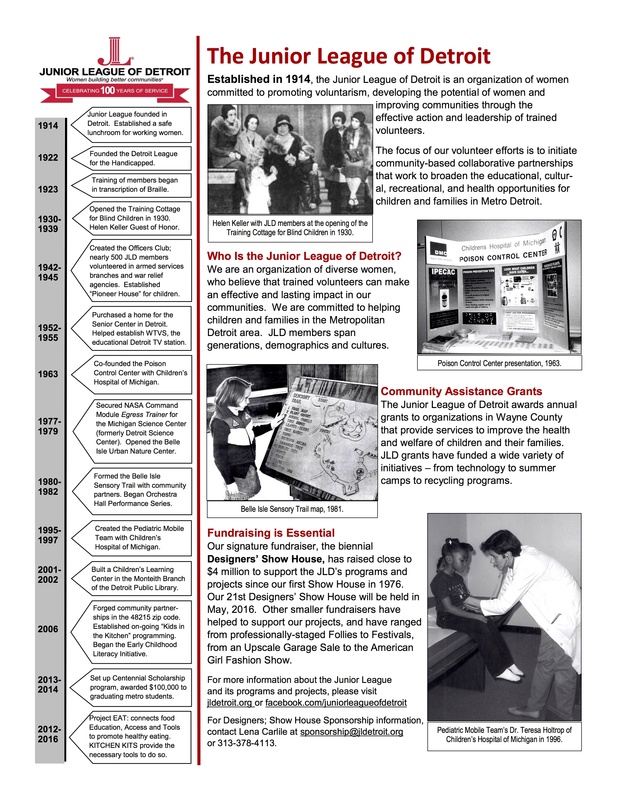 Every year, the Junior League of Detroit distributes Community Assistance Grants to organizations in Wayne County that provide services to improve the health and welfare of children. Our grants have helped in a wide variety of ways – from securing tools and technology, funding field trips, to helping to implement a local recycling program. To help mark the JLD’s 100 years of service, the Centennial Scholarship program awarded $100,000 in scholarships to 100 high school graduates who had demonstrated significant community involvement through voluntarism in the Metro area. Be a part of a dynamic group of women leaders making change happen in their community. Join the Junior League of Detroit! Prospective members must be at least 21 years old and live within a 50 mile radius of the city of Detroit. Visit jldetroit.org for more information on how you can become a member.